Since the last newsletter the Association has not had much activity but in the near future some significant activities will occur. Firstly the Annual General Meeting and Dinner will be held at the United Services Club on Thursday 17 September 2015 at 1900 for 1930 hours. We have changed to a Thursday due to the difficulty of getting bookings. The night is a very relaxed dinner during which the necessary activity for the conduct of an Annual General Meeting occurs. At the end of the dinner we look forward to a brief update of “The Status of the Regiment”, given by the Commanding Officer. The cost of the dinner is $80. This price is subsidized by the Association in order to encourage members to attend this important evening. If you wish to attend, please go to the notice about the dinner in this newsletter and email Peter Morton of your attendance. Payment can be made by electronic means or payment is accepted on the night. As usual the old executive management committee will stand down from their positions and a new committee will be formed (President, Vice President, Secretary/Treasurer, Membership Secretary/Website Manager, History Manager, Newsletter Editor, Committee members.) Should you be prepared to be available for any of the positions please let me know and I will make the necessary arrangements for your nomination to go forth. This year we have not invited anyone to deliver a post dinner address. Instead we wish to permit sufficient time to discuss the future operations of QURA. If we have you current email address you will receive a discussion paper on where the Association currently stands prior to the AGM/ Dinner. A copy of this paper is also included in this newsletter. It poses some questions in order to promote some discussion at the AGM. You are encouraged to read the paper and contribute to the discussion. You can contribute at the AGM. If you cannot attend you are invited to email your comments to me so I can include them at the AGM. Send to President. We are still electronically scanning all new documents and photos to add to the last written history. If you have any photo or document from any period of QUR please allow us to borrow it so it may be scanned. Or even better scan it yourself and send it to us by email. I look forward to catching up with you at the AGM/Dinner on Thursday 17 September 2015 at the United Service Club. will appear in the next QURA Newsletter. 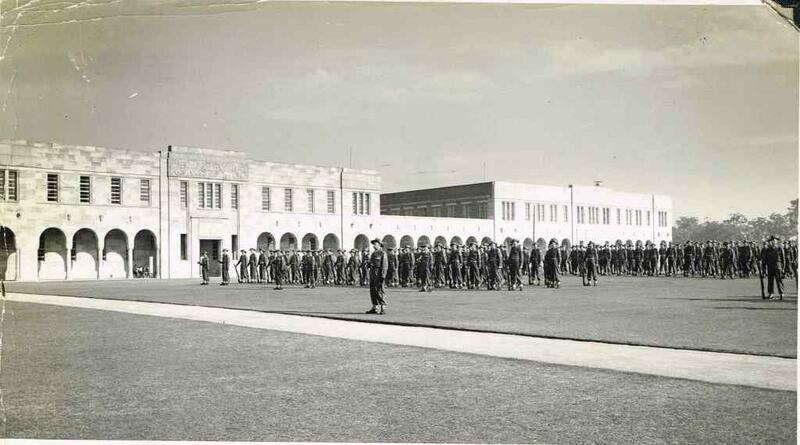 The members who attended the AGM in 2014 will recall some discussion being held about the possible future of the Queensland University Regiment Association. Following that meeting, a survey was conducted to identify what other members might think. Since then the Executive Management Committee has conducted an in depth study of what the future might look like. Using all of information gathered the following discussion paper is offered to members for consideration at the 2015 AGM in September. All members of QURA are encouraged to consider the paper and then attend the 2015 AGM/ Dinner to be held at the United Service Club, Thursday 17 September 2015. Should you not attend the AGM/Dinner you are encouraged to send any comments prior to the meeting by email to the President so your comments can be included that night. Please email them at least by 10 September to give time for an executive summary to be printed for the night. For some time now the Executive has been concerned about the future prospects of the QURA. The Regiment itself has changed dramatically in recent times. QUR today is almost the same as the Training Groups of yester-year (a military school), running its allocation of a variety of national courses, with students travelling around the country to attend, and instructors assembled for the conduct of each course. The Regiment is now a shadow of its original self. It has an Officer Cadet element (its annual intake) and an Instructor/Administration element. The primary focus of QUR’s operations is conducting post-commissioning courses and some technical courses e.g. drivers (See below a table of instructional courses). Units nominate students to attend these courses. Officer Cadets enlisting in QUR, travel the country for their modules and QUR administers them in the process. QUR is employed with a limited number of training days in the pre commissioning course. The Officer Cadets graduate at the Royal Military College (RMC). As a consequence, the Officer Cadets joining QUR as we did, no longer have the same Regimental experience which QUR used to offer, and therefore it is understandable that they do not identify themselves in the spirit of QUR. Their “alma mater” is probably RMC. This has reflected in very little interest in QURA despite our various efforts and approaches in activities, contact, prizes and presentations. In addition, the Regiment does not have the numbers to conduct ceremonial activities involving its Colours. 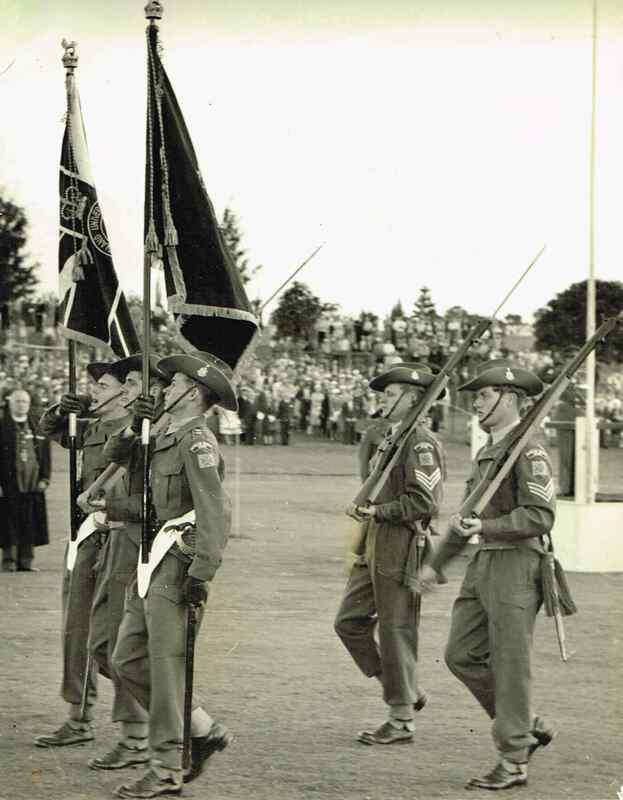 Many of the traditional activities conducted by the Regiment are no longer held (ANZAC Day, Regimental Parades etc). QURA therefore has a diminishing membership prospect, consisting essentially of people with service in QUR between 1950 and 1990. The QURA’s current objects are to “protect the history and traditions” and “support serving members” of QUR. The majority of people passing through QUR now do not identify with QUR and have no real reason to do so. While the “traditions” do need to be remembered by way of history, they are no longer relevant in current/future times using the present organisational model. Secondly, the Association’s object of member support therefore becomes a questionable use of its limited resources. The outline above is provided to put a focus on future prospects and activities for the Association. · Preservation of QUR history, its compilation and update. This includes support for the CO in such matters as and when needed. · Maintain a contact point for those who do identify with QUR, by way of social occasions and activity as the members define. For most members with a QURA viewpoint, this refocus may not appear significant. Essentially, it shifts the focus of support to the Regiment to the internal conduct of its own operations and activities. For some, it would be a distancing from the Regiment. Essentially it is more a scaling back of the activities of the Association to a level which can be maintained into the future. This is not a peculiar problem in the area of “past member associations”. The essential difference here is that there is a near cessation of ongoing member numbers from the traditional source – QUR itself. There is no alternative source, other than relying on locating former members in the 1950 to 1990 period. This does not preclude anyone – it is more a recognition of changing circumstances. The Executive Management Committee hopes you can support this proposed shift refocus the activities of the Association. Note: QUR’s responsibility for the conduct of training for the First Appointment Course is 11.2% of its total training day commitment. The Annual General Meeting for the QUR Association will be held at the United Service Club, Wickham Terrace, Brisbane on the evening of Thursday 17 September 2015 at 1900 for 1930 hours. I will be attending the Association’s Annual General Meeting / Dinner to be held at the United Service Club, Wickham Terrace, Brisbane on the evening of Thursday 17 September 2015 at 1900 for 1930 hours. I understand that from 10 September 2015 should I later find that I cannot attend, I will be liable to pay for the function. The Regiment provided its first Guard of Honour. The occasion was the opening of Parliament by His Excellency the Governor LTGEN Sir John Laverack. 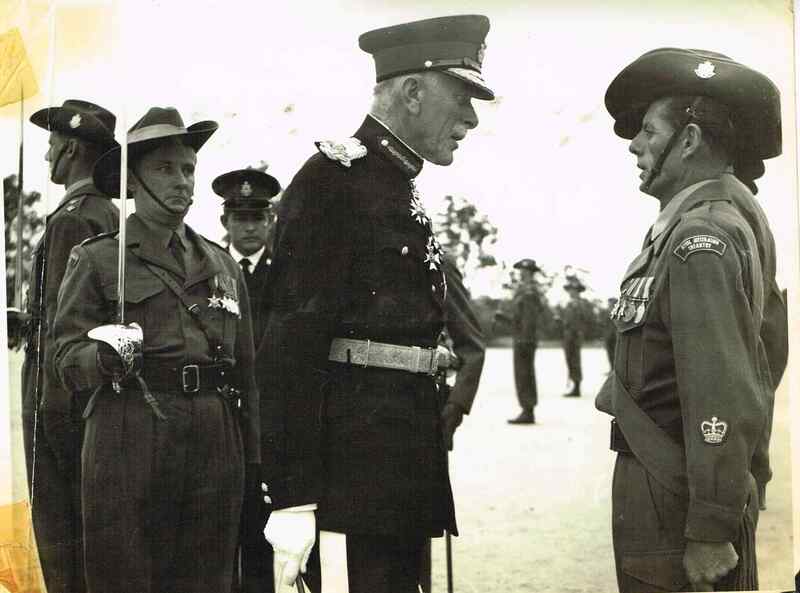 Captain T. Parslow (Guard Commander), MAJGEN Nimmo GOC Northern Command, Privates G. Aronsten (obscured) , J.J.A. Kelly, J. Kelly, R. Bennett, J. Nutter, S. Vitale. The Regiment is Presented with Colours by His Excellency Colonel Sir Henry Abel Smith K.C.V.O., D.S.O. 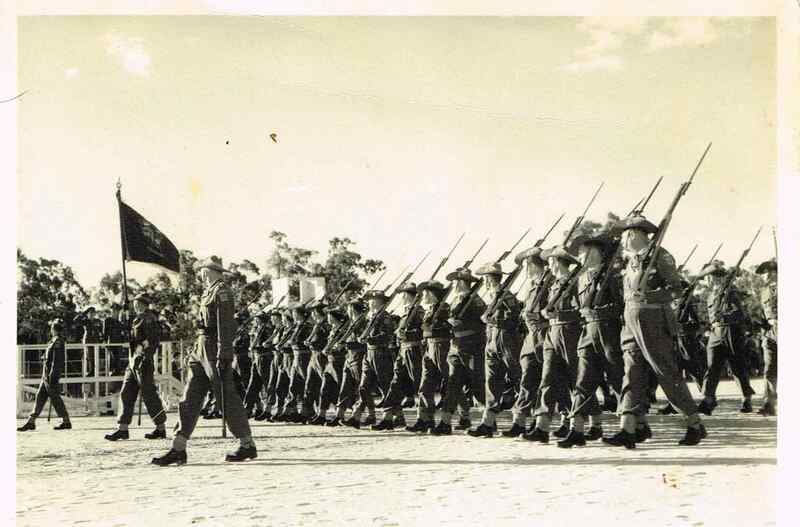 The trooping of the Regimental Colour for the Honorary Colonel on the Wacol Parade ground. 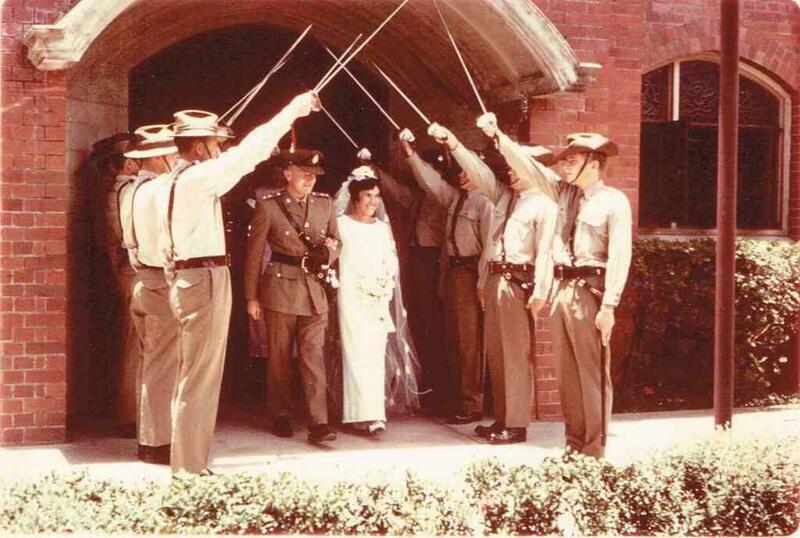 Guard of Honour for Lady May Abel-Smith at the University of Queensland. Trooping of the Queens Colour for His Excellency Colonel Sir Henry Abel Smith K.C.V.O., D.S.O. From left to right: Commanding Officer LTCOL P.D. Connolly, ADC to the Governor CAPT V.V.G. Hawke (QUR), His Excellency The Governor. QURA has received the following invitation from QUR to attend their Regimental Dinner on 10th October, 2015. This invitation is open to all members of QURA. If you wish to attend, please contact QUR directly as per the invitation. In response to requests from QURA President, Trevor Luttrell, for members to provide details/reminisces from their service in QUR, Trevor has received an article from a former QUR member, Toby St George. Below is part I of Toby's article. Toby St George enlisted into QUR 14 May 1950. Recently he commenced writing about his military service. Rather than spending time attempting to get a very precisely worded document he has quickly jotted down the memories in no particular order. The document below is the first of many of his contributions. The rest will follow in future newsletters. For some time I have been encouraging QURA members to contribute to the written history of QURA by simply writing of their time in QUR. Just write short paragraphs of your memories. As you think of them write them down. They do not have to be great literary masterpieces. All they need to be is short statements, stories or memories. Send them to me as a series of short paragraphs. They do not have to be linked. As you read the work done by Toby you can see what I mean. The recording of the time of members in QURA is a valuable insight of the history of QUR. Please help me to record this area of QUR history as I complete the next update of the “History of QUR”. We need personal glimpses of what it was like serving in the Regiment I need members from all years to write of their service. I am writing of my period of service….. what is your excuse?? I was in Churchie cadets but did not get to cadet officer or sergeant. Most of the school was in the cadets on Friday afternoons and a short camp was held each year. One at Frazers Paddock formerly part of the Enoggera complex area was memorable in 1946. Wartime cooks –very rough incl stirring oatmeal porridge with a hairy arm. In the afternoon the porridge was still entangled in the hair. We had a regular 3 inch mortar team do a demonstration with smoke bombs. This set a grass-fire that rapidly spread. It was heading for the live ammunition stacks that were still around from WW2. The regular warrant officer next to me yelled come on and I followed him in a dash to the edge of the flames and stamped out the bad edge of the fire as it went under a large stack of grenade boxes. We looked around and we were alone. The whole school cadet unit plus regulars was disappearing over the ridgeline. A water tanker and crew dealt with the rest of the fire a few minutes later. I lived at Wynnum North. Very few people owned cars and a lot of them were junk. New cars had to be ordered about a year in advance. This applied until the mid-fifties though petrol rationing ceased by1949 or so. To get to parade I had to train to South Brisbane, tram to West End ferry and walk to the St Lucia Campus. We got our fare money with our pay. This was revoked later. The long St. Lucia central building was there and two buildings in the horseshoe were under construction. QUR had a Q store in a hut. Half the grounds were undeveloped and used for vehicle training incl Bren Gun Carriers. I heard on the bus at 8.30 am about QUR and enlisted the same day on 14 May 1950. I got my papers at midday at the George St QUR HQ in a hut in the Domain from a S/Sgt. I went home after lectures and got my parents signatures. Train and trams to Kelvin Grove barracks to 9 Bn for a brief medical. One other potential recruit was with me. He said he had a glass eye but a good memory so I should read the eye chart very loudly. He was examined by the doctor then his eyes were tested. Unfortunately, the doctor put his hand over the good eye and he reeled off the chart. The doctor said very good – now try it facing the chart. SMLE .303 Rifle and bayonet, web belt, shoulder straps, basic pouches, small and large packs , enamel water bottle in carrier, Service dress WW2 pattern. Khaki long pants and shirts, tan hobnail boots, leather laces, gaiters, groundsheet, greatcoat, kit bag and shoulder patches to sew on. Rifle was taken home. My trousers were obtained from cadets as I was too small. We gathered on Saturday morning at Roma Street, trained to Wacol, and marched the short distance to the camp area. 9and 25 Bns plus artillery and a vehicle unit were in camp. We were issued with a towel, shelter halves, rough working dress, blankets and razor blades plus WW2 tin-hats. We had no cooks. After settling into 6 man tents , we had lunch. After lunch Corporal Pat Shanahan (later Judge) drilled the half dozen recruits. He had a sore head from the advance party rum and did not last long. The officers were Captain Parslow and John Scanlan (Med student). We saw them erratically and all training was done by Jim See CSM, Stephen and John Pozzi and Guy Ethell (Med student) . I have forgotten the CQMS's name. Three platoons. We shot Austens on a 25 metre range. Lousy weapon that needed a magazine filler. Lots of stoppages. PIAT inert. Redbank rifle range was used for a day. Ammunition plentiful. No ear protection. Threw M60 fgrenades rom very, very small gullies. My first one landed very close and John Pozzi grabbed me and flattened me as it went off about 2 metres away. We had no practice grenades. 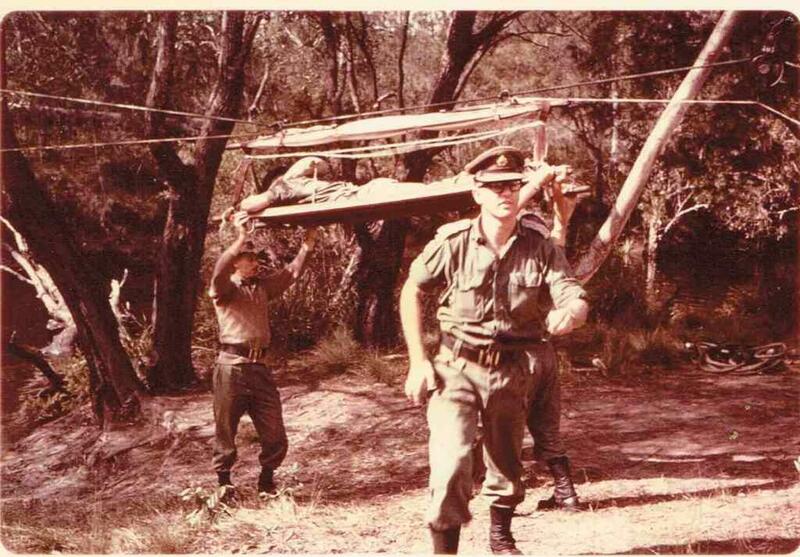 Section training was done in the bushland which was plentiful back then. The confidence course caused the first casualty as it was done with fixed bayonets. Someone hesitated and got stabbed in the backside. Mess duty was a day. Hygiene moderate. Freezing 5 blanket weather at night. You can see that my training before participation in live firing exercises was minimal. Another event was a Sunday formal parade of the two Bns plus a pipe band and a brass band in different tempos. Parade was a shambles. Leave on one Saturday night was to Ipswich on trucks to a local unit organised dance. Almost no-one there so a few of us went to see The Red Shoes film. When we came out trucks had gone. We had to walk back to Wacol. No traffic on the dark winding narrow road. Fortunately my mess duty was next day. Monday we embarked on a convoy for Noosa. Trucks were open articulated WW2 vintage. Slow hot trip on basic winding Bruce Highway. Lunch at Nambour showgrounds. Cold cuts and bread. Field rations then were a third of a small can of Bully Beef and a packet of rock hard biscuits plus water. We arrived at Noosaville about 4 pm. Small issue of hot stew served from Sawyer Stoves. We then reloaded and travelled to Golden Beach and pitched our two man shelters. Sand comfortable and warm. Some form of cooked breakfast. Lunch Bully Beef in cans. In the mornings we did dry runs of section, platoon and company attacks. Later live rifle rounds plus overhead Vickers machine guns and overhead 25 pounders. I heard the creaking of shells passing over for the first time. On the Thursday the RAAF Mustangs turned up and the area near Coolum was bombed, napalmed, and strafed from west to east. I am unsure if it was in coordination with one of two battalion attacks. By the time we reached the “peanut” feature the bombed area was blackened and vegetation in a bad way. Early Friday morning we had to search for and mark blinds. Fires still burning. Return trip to Wacol the convoy got lost in the Wilston area and we passed and repassed trucks heading in the opposite direction. Someone sorted it out and we arrived at Wacol after dark. Home training was a mix of Sunday parades mostly in terms 1 and 2 and odd bivouacs. There is no record of my attending a specialist course in August vacation to learn signals specialisation. This was on the St.Lucia campus. We slept in the gym in the main building. I have no recollection where the cooks came from. My vague recollection that our ARA instructor was WO1 Scotty Armour who I had met when in Signals platoon in Cadets. We did have some WW2 walkie talkie sets on crystal frequencies. We learned to operate. He took us to WW2 training films in the auditorium of the Catholic Church in Paddington that had a projector. We had to learn to climb poles and join sig wire. It was WW2 vintage in appalling condition. Bill Catchpool became the signals sergeant. In January I joined a few other QUR members as instructors. Sergeant Guy Ethell was one. I was appointed a L/Cpl to allow this. Cadets were keen and very cooperative. 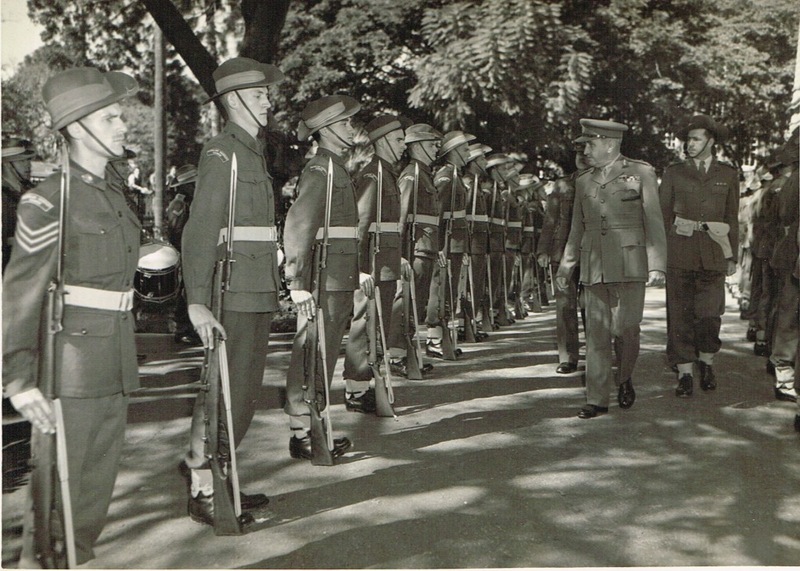 Training reopened at the start of Ist term 1951 at St.Lucia. Admin remained in the Domain on the George St Campus. I went to a course conducted at Kelvin Grove Barracks, a weekend and 5 nights on Methods of instruction. An ARA touring team lead by Captain Grant produced an excellent course. I encountered him later in 1RVR pentropic as 2IC and CO of 6 RVR, when the change back to normal battalions occurred. I will follow up this though as it had effects on my army career. After a couple of years on the reserve due to a job in the USA, I joined CSIRO in Melbourne. 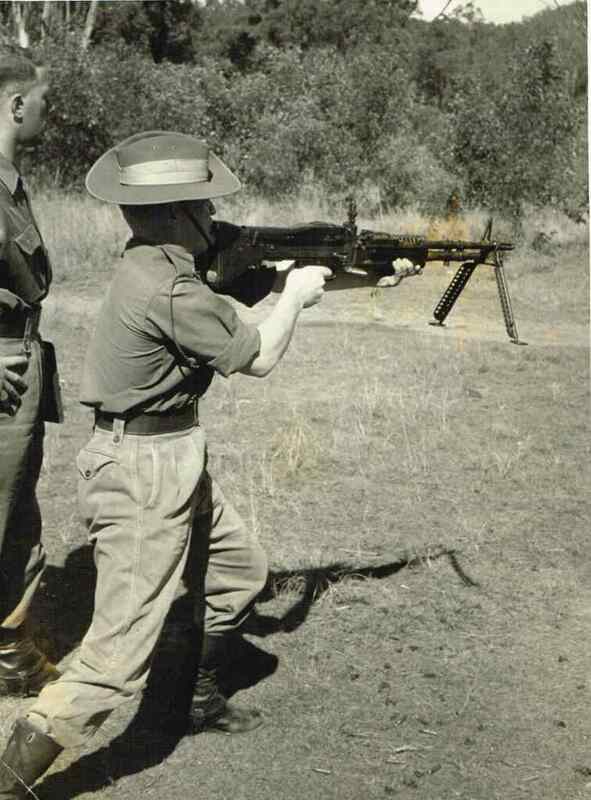 I could not return to active service until a shoulder reconstruction for damage due to a jeep smash in QUR in 1955 and a dislocation in 1958 in 27 Bn in 1958, when I saved a soldier from drowning in a river crossing exercise at Mt Gambier. I went to 1RVR HQ in Swanston St Melbourne, the HQ Depot. Lt Colonel Grant interviewed me. He said I can’t find any record of you in the stud book. I produced my commission signed by Sir William Slim. He then agreed to take me and the CO concurred, I was appointed as 2IC of C Company located there. Every move I made was reported to him. HQ interfered with lots of things outside the chain of command. 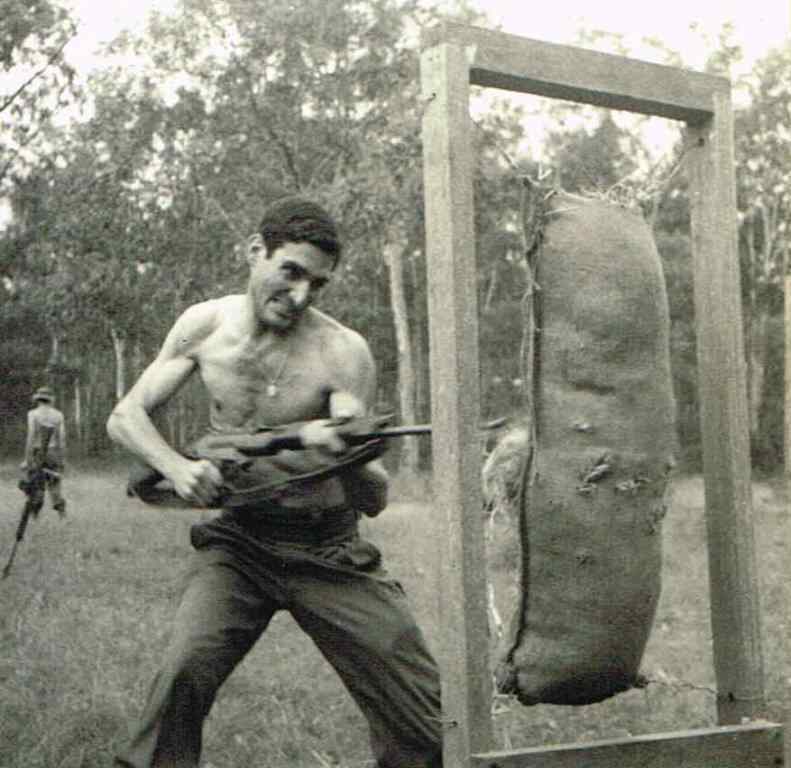 First clash at annual camp 1962 in the Victorian Alps in a freezing May. I was detached from C Coy to run the central HQ area handling cooks and getting hygiene under way etc. The Pioneer Lt said the meat supply was off and contacted Grant. Grant came to me and said to destroy it. I said it is perfectly okay and just needs a rinse before cooking. Grant said the Pioneer Lt had done a meat inspection course by correspondence. I said I have a vet degree and have considerable experience in abattoirs inspection and taught meat inspectors. Stalemate. The CO, the very formidable Colonel George Warfe joined the argument. He said to the cook cut me a piece of steak and cook it. He then ate the lot and said the meat is okay. The Pioneer LT said he had already given instructions to his company to destroy it. I hastened to that kitchen and found the meat had been dumped down one of the many mine shafts in this old gold mining area. They had poured petrol down after it. I watched as they had just given up one dropping lighted matches down and floated down a wad of lighted newspaper. Two peered over as edge as nothing happened then caught a blast that removed their eyebrows. The toilet lids on adjacent mineshafts blew up a mess. An investigating team on the meat came up from AHQ and heard evidence and pronounced the remaining meat excellent. I had one or two other minor disagreements with Lt Col Grant when he bypassed me to junior lieutenants in front of my troops. The final event was at the army reserve near the Port Phillip Heads on a bivouac weekend. The ocean side, Cheviot Beach, consumed Harold Holt, later. The inside of the headland had a small safe sandy bay. A swim parade was organised early one morning for my company and I was giving orders on not going out too far, when Lt Colonel Grant intervened. He said I have appointed the Pioneer Lt to supervise safety as he has a Bronze Life Saving Certificate. I said I will see he does as I have a Silver and a First Class Instructors Certificate. The naked company burst out laughing. The next week I was transferred to the new 4 TF HQ as staff-captain A and met some fellow transferees. Bar the Ordinance Captain they were first class. This camp was held at Pomona on week 1 and Golden Beach week 2. This was the first time the unit was split with some left at Pomona. The CO was Lt Colonel Gus Gehrman . OC A Coy was Captain Tommy Parslow. RSM WO1 Bruce. We camped in the Pomona Showgrounds. (9 Bn were at Cooroy). 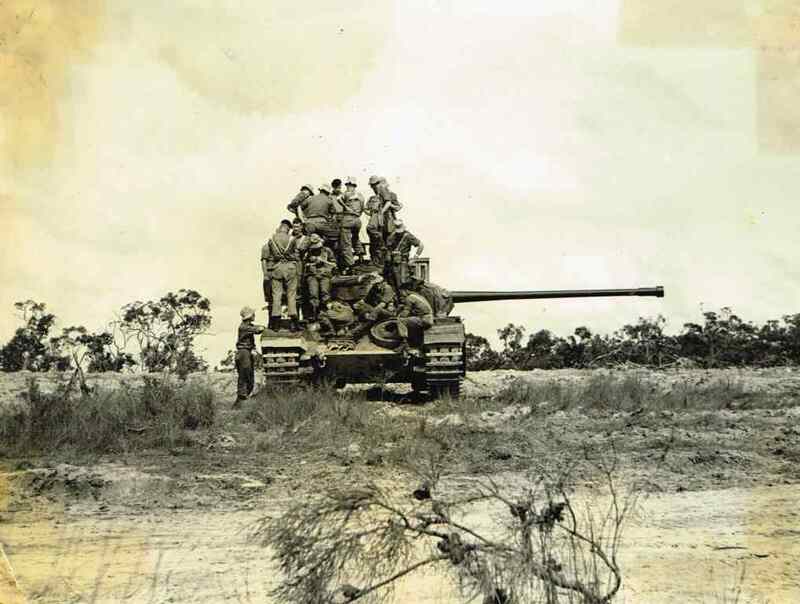 Our Bren gun carriers were detrained at Cooroy and driven to Golden Beach. 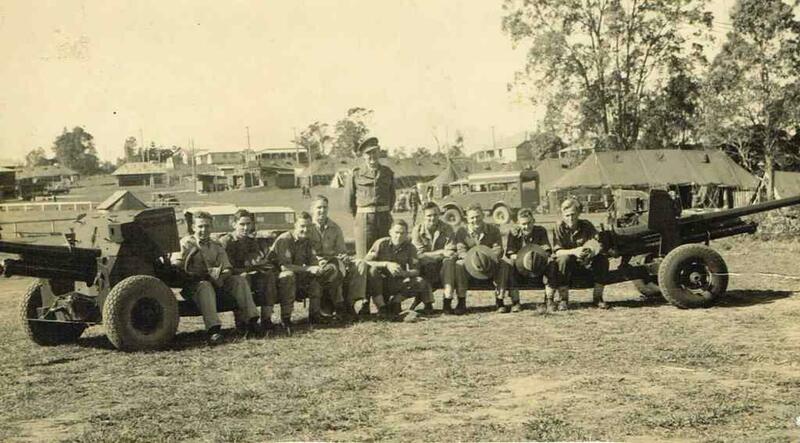 I remained at Cooroy in the first week though the rest of the Bn except most of the Sig Platoon were elsewhere. Radio set 122 in poor condition but could communicate with the forward Bn set. Kitchen provided by another unit. Mess in show pavilion. Lived in 2 man tents. Quite warm. Mosquito nets essential. Able to go to a film at Pomona theatre one night on local leave. Minor training under Bill Catchpool, our sergeant. He went to navy, later. One evening Harry and I were in our tent and ready for sleep when an Aldershot grenade was bowled into our tent by Bill Catchpool as he exited the camp. I rolled up in the wool blankets and Harry rolled out as the mosquito nets and tent that exploded in flames. Both uninjured. Fire piquet quickly stopped the fire. I was a corporal and Harry a Lance corporal. No officers were around. I was very annoyed but Harry collected our burned clothing items and gear and exchanged them for those in the sergeant’s tent. No further action. On the weekend the balance of the Signals Platoon joined A Company HQ at Golden Beach. We were visited by some brass from Brisbane. One day there was an excercise where vehicles and the Bren Gun carriers were transported on army rafts across Lake Wyeba. It was generally shallow but tidal variation considerable. The raft grounded a bit before the shore on a sandbank. The visiting regular general was impatient and said I want to see it ashore. Sergeant Albie Wyatt said , “The water is too deep in the gutter, sir.” The general said “Cant you follow orders. “Albie pinched his nostrils together held on and said “Driver Forward The carrier and crew disappeared under the water and floated up. Engineers recovered the carrier later. Seventeen pounders had a shoot with targets backed to the sea. The first shot was followed by a couple of powerboats heading for South America. This was followed by Mustangs strafing followed by napalm. Later in the week we dug in, in the sand just south of Golden Beach. I was Tommy Parslow’s signaller. During the night we were attacked largely by our drunken regular adjutant and mates. They threw half sticks of gelignite around for sound effects. One came very close to the HQ pit. Tommy called the adjutant over. He then loaded his Very pistol, cocked it and said “Have ever seen what one of these flares does to a man’s guts? Drop all your gelignite and Go!”. We had a bonfire and burnt all the gelignite. The adjutant was living in the Laguna House Guest House and not with the unit. A later CO lived outside camp often. The mortar shoot was held up next day as the Chief Safety officer from Victoria Barracks was hung over until close to midday and could not get out of bed. The unit went back to Pomona and cleaned up and packed gear. On the Sunday we marched to Pomona Station. We travelled back in dog box carriages to Roma Street station. They were attached to a scheduled civilian train. A pit stop was at Landsborough station. We dispersed at the station so must have been paid at Pomona. QURA President, Trevor Luttrell, is quietly working away compiling a digital photographic history of QUR. Below is some of his efforts. If you have any photos of your time in QUR, please contact Trevor via email by pressing (President) . 1967. CAPT J. Pearn and S/SGT K. Daddow demonstrating a creek crossing for a stretcher case. 1957. The parade held to celebrate the opening of the new depot at St Lucia. 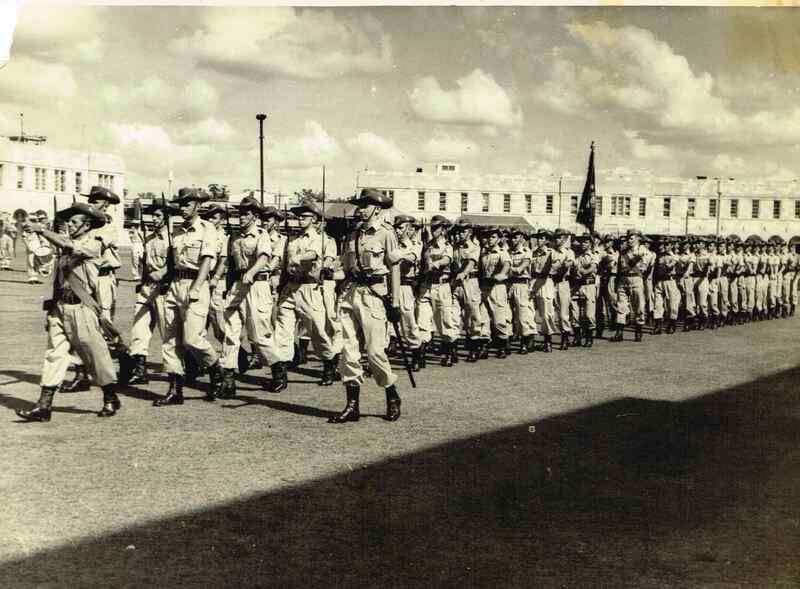 Note the number of soldiers on parade. The outcome of a battle depends not upon numbers, but upon the united hearts of those who fight. To make war with those who trade with us is like setting a bull-dog upon a customer at the shop door. War is much too serious a business to be left to military men. In order to have good soldiers, a nation must always be at war. Tactics is the theory of the use of military forces in combat. Strategy is the theory of the use of combats for the object of war. It’s not a very nice solution, but a wall is a hell of a lot better than a war. President John F Kennedy 1961 Commenting on the building of the Berlin Wall. One thing about our local MP. He’s an honest politician. When he’s bought he stays bought. Dad is popular in prison. He is the lifer of the party. You are charged with habitual drunkenness, what is your excuse? The good seaman weathers the storm he cannot avoid, and avoids the storm he cannot weather. The last time I spoke here I was to address the annual convention of the Clairvoyant Society, but it was cancelled due to unforeseen circumstances. You have often been described as a pain in the neck, but I have a much lower opinion of you. The biggest surprise you can give your wife on her birthday is to remember it. - To an empty stomach white bread tastes like brown. - To be in the habit of no habit is the worst habit in the world. - Good scribes are not those who write well, but who erase well. - Good things sell themselves, bad things have to be advertised. - One dog cannot fight. - The higher the castle the nearer to the lightning. - A full cabin is better that an empty castle. - Before going to war say one prayer; before going to sea, two, before getting married, three. - Peace makes money and money makes war. Tony was a good mate of mine even though we saw very little of each other over recent years. However, I have just returned home from his funeral in Cobbitty, west of Sydney. I flew down at 6:00 am this morning. It was a military funeral, well attended by around 200 people. Tony also had an AM for services to Veterinary Science and was on a plethora of military, veterinary and wildlife preservation committees, many of which he chaired. He also was the Commander Land Force Artillery for a number of years in the ‘80’s. Not a small feat for a Reserve Soldier. And last but not least, I never heard Tony say a bad word about anybody, never. He is survived by his wife, Shelley, three great sons, Tony, William and Tom as well as about a dozen very well behaved grandchildren. Tony would have been justifiably proud. 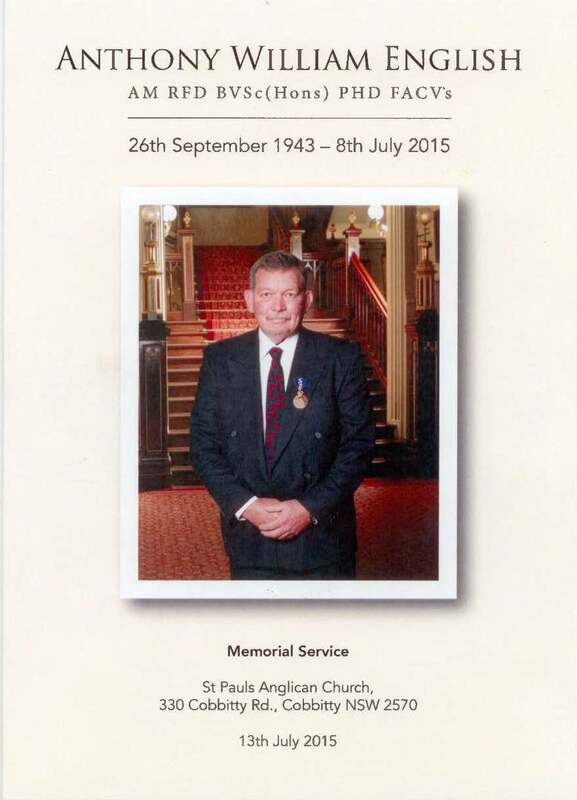 I have attached a shot of the front cover of his Memorial Service booklet. Maybe a few of the QUR Members of the time might like to see it. I was very saddened to hear of Tony’s passing. He and I were in the same class and graduation group through QUR and were close friends. Although I didn’t keep up with him when I went overseas or in later life the memory of our time together in QUR always remained freshly with me. It also serves to remind me of my own mortality. You may be interested in the paragraphs below, forwarded by the School of Veterinary Science, University of Queensland. For information, below is an announcement of the death of one of our distinguished alumni, Assoc Prof Tony English who was on staff at the University of Sydney veterinary faculty for many years. We received the notice from a military colleague of his. It is with sadness that I inform you of the passing of Colonel Tony English AM RFD, past Commanding Officer of 23 Fd Regt RAA and Commander Land Command Artillery. Colonel English passed away at Campbelltown Hospital on 8.00pm Wednesday 8 July 2015, aged 71. His Funeral Service will be conducted at St Paul’s Anglican Church, 330 Cobbitty Road, Cobbitty NSW 2570 on Monday 13 July 2015 from 1100 hrs. Flowers and expressions of sympathy may be sent to St Paul’s Church Cobbitty on Monday 13 July. The family will be asking for donations to be made to Parkinson’s Australia. Details will be advised. I would like to share with you LTCOL Ken Broadhead's account of the remarkable career of COL English. Colonel English served as Commander Land Command Artillery from 1988 to 1997 in which time he was very well known by the Gunner community and Formation headquarters throughout Australia. 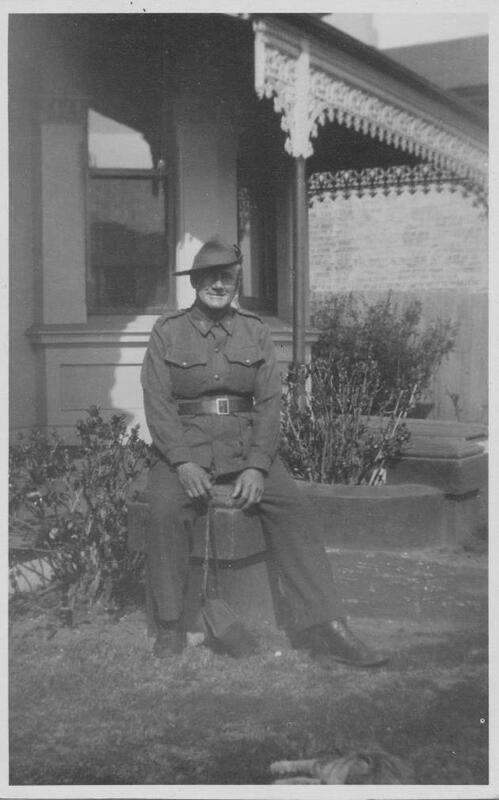 He served in the Australian Cadet Corps at Churchie Grammar School in Brisbane. In 1962 he enlisted in Queensland University Regiment and was commissioned in 1964. From 1968 to 1974 he served in Field Artillery Regiments in Queensland. In 1977 he came to Sydney and in 1978 was appointed Commander 133 Divisional Locating Battery RAA. Promoted Lieutenant Colonel in 1979, he served as a Tac 5 Instructor at 2 Trg Gp, and in 1981 was attached to Aberdeen University Regiment OTU and served with 49 Regt RA in Germany. From 1981 to 1984 he was Commanding Officer 23 Fd Regt RAA. There followed Training and Plans postings and he was promoted Colonel as CDA 2 Div in 1987. From 1988 to 1997 he served as Commander Land Command Artillery and oversaw the RAA Air Defence support to the RAN during the 1991 Gulf War. From 1997 to 2000, when he retired from the Army after 38 years service, he was attached to Land Command Health Services as Veterinary Adviser. In civilian life Colonel English earned a Bachelor of Veterinary Science (H1) and PhD from the University of Queensland. He was an Associate Professor at Sydney University Veterinary School at Camden near Sydney. He was Director of the faculty’s Deer Unit and a world expert on large domestic and wild animals. In June 2006 he was appointed a Member of the Order of Australia for his service to Veterinary Science in the field of wildlife health and conservation through research, education and professional organisations. I have been away for the past week. That is sad news to come home to as I remember when he first joined the Regiment. Many thanks for letting me know. I had met him a few times many years ago - a true gentleman. The following journal is now available for free – recently digitised. Here is a Photo and an Obituary of Rod Allen who served in QUR. Sam sent me the photo and the cutting from the courier mail. 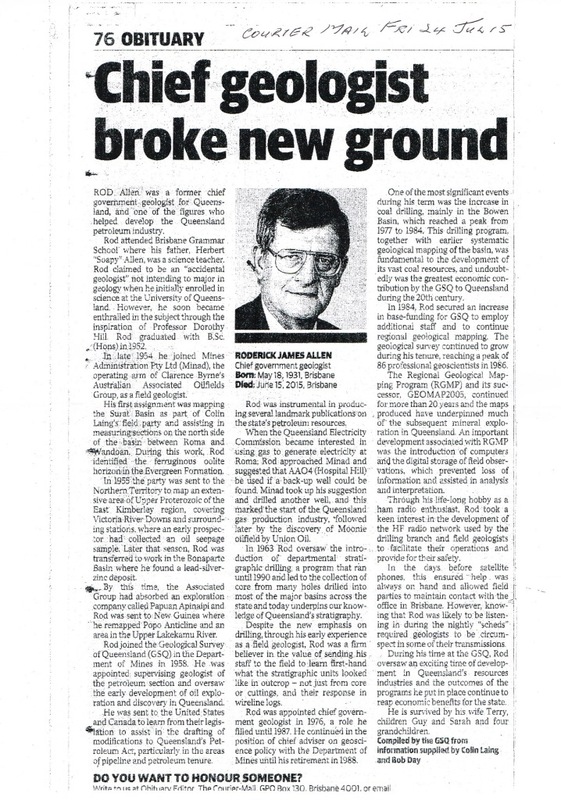 He had a steely determination and it is no wonder he became the Chief Geologist (Qld). He was a product of BGS Cadet Corps and QUR. 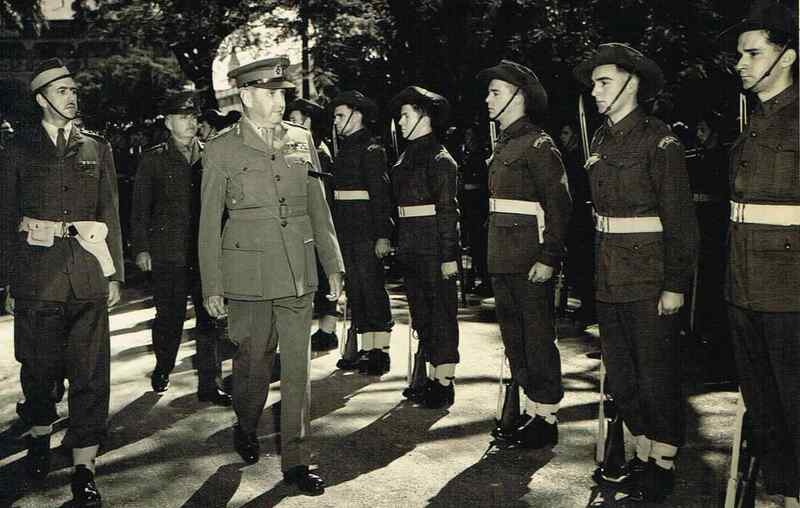 In the photo from the front left is Sgt Jim Mathers then Pte Rod Allen at the Guard of Honour for the Opening of Parliament August 1950. Notice that Rod’s hold on the rifle with his right hand is that his fingers are split. Tom Parslow (CO) is beside the Governor who is inspecting the guard. Rod went to the Reserve of Officers after reaching the rank of Lieutenant. With fire at one end and a fool at the other! And kills you by his bills!